As the spring season comes into full swing, many Ohio residents are packing up their possessions and relocating their families to a new location. While moving is a process often full of stress and excitement, many times people get too caught up to take the proper time to make their four-legged family members feel more comfortable. Everyone else may be stuffing boxes, yet your canine will be left out of the loop. Keeping your dog happy will keep you happy, and The Dog Wizard is here to help in both cases! Our Cincinnati dog training experts are here to help you and your pup work together in order for him to more fully be able to enjoy life. From our top-notch obedience training for dogs to restorative aggressive dog training, each service is offered to help your furry family member to feel calm and confident in any situation. 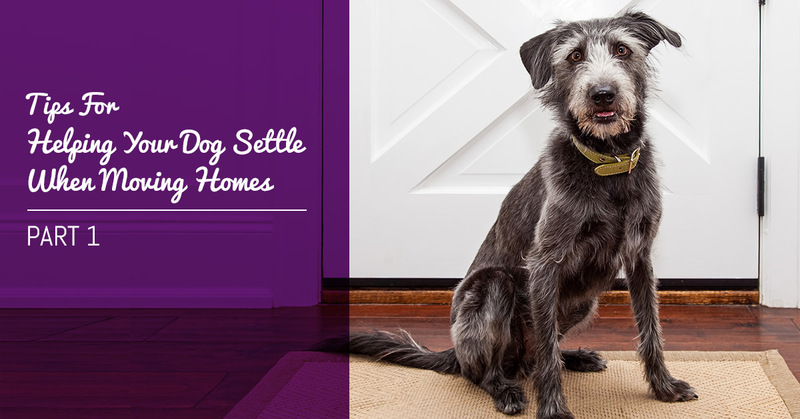 Today, we’ll take a look at a few tips that can help your dog better adapt to the new home. If you are looking for the best dog training in Cincinnati, The Dog Wizard is ready to help! From the moment that you start bringing in moving boxes, chances are that your furry companion knows something is going down. Dogs are comfortable in their own environment, but once this starts to change, stress can start to seep in. It’s vital to keep everything as positive and supportive as possible. Be sure to provide plenty of attention and positive reinforcements during the packing process. Packing is often best done with the pup outside if it’s feasible. When the movers arrive on the big day, try to keep your dog safe and secluded in its crate or bedroom. Remember to provide familiar items to help keep the canine calm, and providing a fun toy to keep them busy never hurts. One mistake many dog owners make during the moving process is failing to walk or exercise their dog per the usual routine. Giving your furry friend a walk will give them the chance to work off some stress while also providing them with bonding time with their human. Leaving your chaotic home for a little bit can prove beneficial for alleviating doggie stress. This will also be a viable time to work on some of your commands to ensure that your dog is not rusty on their obedience. In strange situations, canines will be more calm and collected when they have a sturdy training portfolio to give them guidance. Our dog training school places a premium focus on instilling obedience commands to keep your pup cool in any scenario. Transporting your pup to the next place can come either via the back of your car or an airplane. Regardless of what method is used, it’s important to keep both you and your pet calm. Make sure to use a positive, exciting voice when putting your dog into its kennel, as canines can pick up on the tone of voice often more than the words being used. Again, familiar blankets and toys are helpful for providing comfort. Keeping the dog calm and even distracted with a toy is the best approach to traveling any span of distance in either vehicle. One tactic that some people employ in keeping their canine calm is using medications. The Dog Wizard recommends avoiding this, as it can serve to further stress your animal while adding uncertainty to their health during plane trips. The use of calming sprays is one method that includes pheromones that help to naturally calm your upset pup. This spray may be useful in the kennel for the trip, but receiving professional recommendations is a good practice. Consulting with your veterinarian is a beneficial approach for preparing your pets for the move ahead. Moving can be a very stressful experience for canines. Keeping them calm and relaxed during this chaotic process is very helpful for keeping all family members happy. Next time, we’ll conclude this subject by breaking down what to do once you are at the new location and ready to settle in. Your canine’s behavior and training can help to determine the overall challenge of moving. Anyone seeking Cincinnati’s dog training experts will more than pleased with The Dog Wizard. Our certified, professional dog trainers are here to help your pet get the most out of life. Browse our site to learn more about our dog training school or contact us today to get started!